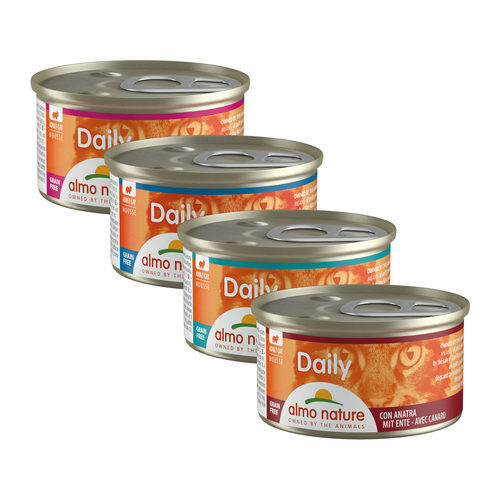 Almo Nature - Cat - Daily Menu Mousse is a tasty meal for your cat. Because there are no less than 11 different flavours, you can vary the flavours to surprise your cat. This cat food does not contain artificial colourings and preservatives. Almo Nature - Cat - Daily Menu Mousse is a delicious mousse for your cat. This meal contains tasty meat and fish along with vegetables, egg and rice. Because this cat food is available in 11 flavours, you can also vary the flavours to surprise your cat. This cat food does not contain artificial colourings and preservatives. Salmon: meat and animal derivatives, fish and fish products (salmon 4%), minerals, vegetable fibre extracts. Tuna & Salmon: meat and animal derivatives, fish and fish products (tuna 4%, salmon 4%), minerals, vegetable fibre extracts. Tuna & Chicken: meat and animal derivatives (chicken 4%), fish and fish products (tuna 4%, salmon 4%), minerals, vegetable fibre extracts. Tuna & Cod: meat and animal derivatives, fish and fish products (tuna 4%, cod 4%), minerals, vegetable fibre extracts. Sturgeon: meat and animal derivatives, fish and fish products (sturgeon 4%), minerals, vegetable fibre extracts. Ocean fish: meat and animal derivatives, fish and fish products (ocean fish 4%), minerals, vegetable fibre extracts. Lamb: meat and animal derivatives (lamb 4%), minerals, vegetable fibre extracts. Rabbit: meat and animal derivatives (rabbit 4%), minerals, vegetable fibre extracts. Chicken: meat and animal derivatives (chicken 14%), minerals, vegetable fibre extracts. Turkey: meat and animal derivatives (turkey 4%), minerals, vegetable fibre extracts. Duck: meat and animal derivatives (duck 4%), minerals, vegetable fibre extracts. Have you used Almo Nature - Cat - Daily Menu Mousse before? Let us know what you think about this product.